19 November 2010, at 7:12a.m. US - Novus Internationals Thad Simons has been named Ernst & Young Entrepreneur of the Year in the Distribution and Manufacturing category. St Louis-area based Novus International, Inc., has announced its President and CEO, Thad Simons, has been selected from among nearly 300 regional candidates nationwide as the Ernst & Young Entrepreneur Of The Year in Distribution and Manufacturing. Mr Simons received the national award at a gala in Palm Springs, CA, 'for transforming Novus International, Inc. from a one-product spinoff from Monsanto (in 1991) into a diversified, global manufacturer of health and nutrition products for livestock, pets and people', according to Ernst & Young. Since 1991, Novus – whose guiding vision is 'helping to feed the world affordable, wholesome food' – has brought to market more than 100 new products. The company now has employees working in more than 90 countries serving more than 2,500 customers worldwide. And despite economic challenges caused by the global recession in recent years, Mr Simons has continued to guide Novus forward, growing the number of employees from 300 to over 800 globally and achieving annual sales of nearly $1 billion. He has expanded Novus's innovative product portfolio, established new markets and expanded the business into new geographies worldwide. Mr Simons was presented the award at the Ernst & Young Strategic Growth Forum, the nation's premier gathering of high-growth, market-leading companies. In presenting the award, now in its 24th year, Bryan Pearce, Americas Director, Entrepreneur Of The Year, Ernst & Young LLP, said: "Successful entrepreneurs need to take risks and leave comfortable positions behind to build new companies in untested markets. Thad Simons has done just that. By constantly seeking opportunities in products and geographic markets where established companies had yet to tread, Simons built Novus into a 90-country powerhouse. He is very deserving of the Ernst & Young Entrepreneur Of The Year 2010 award in the Distribution and Manufacturing category." 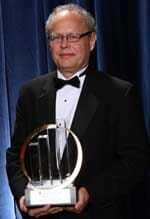 To view a video clip of Thad Simons accepting the award, please visit the Ernst & Young YouTube Channel [click here].